It may be snowing outside in parts of the United States right now, but most of us have our minds on warmer weather. Even though it is still technically winter, a lot of stores have begun to stock swimsuits already. That is just crazy because it is only February! 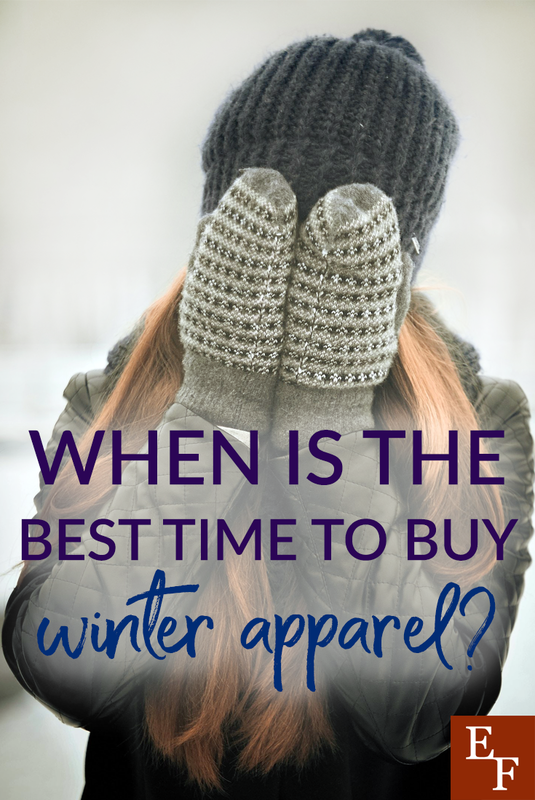 But, if we are buying summer apparel now, then when is the best time to purchase winter apparel instead? If you have children who happen to be growing, then you understand that sometimes they can outgrow their clothes in the middle of a season. I hate it when that happens! But, if your children outgrow their clothes and shoes at the end of the season instead, you may be in great luck. As of right now, it is getting towards the end of winter so we are just trying to squeak out the rest of the season without having to buy new things. If we can hold out for another few weeks, then we will be able to rake in the biggest discounts. Since the summer stuff is already out on the shelves in most stores, that means they have to get rid of the winter stuff. Therefore, any winter apparel still on shelves will be deeply discounted here in a few weeks, if you haven’t run across this already. The downfall to waiting for a few more weeks is that our choices will be limited. If there are certain items that you know you simply must have for next winter, then waiting until the very end of the season may not be the best choice for you. This is due to the fact that you run the risk of not being able to find what you are looking for, in the correct size. And if you get stuck in that boat, then you will have to wait until the winter apparel comes out again and purchase it during the much more highly inflated months. Nobody wants that! So, if you have specific winter apparel needs, then you should be out shopping now! Or, even possibly a couple of weeks ago. Basically, any time after the first of the year are when the winter apparel sales begin. They slowly heat up and become better and better sales up through the end of February, usually. If you wait until March, you’ll be lucky if you find anything at all to pick from. This one may not be for everybody, because most of the clothes at these sales are used. Although, I have been lucky enough to find quite a few pieces of apparel that still had the tags on! If you are okay with second hand, then this is one of the best gems to have in your arsenal. However, shopping for winter clothes at consignment sales actually happens during a completely different time of year than all of the other options. Most consignment sales will have fall/winter apparel during their September or October sale and spring/summer apparel during their February or March sale. So, if winter clothes are what you are on the hunt for, then waiting until September or October is the way to go with this option. If you want to get really savvy about your winter apparel shopping, then there is another lesser known trick. Around this time of year, most retailers are also getting ready for their annual inventory. As a former retail store employee, I can tell you that this is most employee’s least favorite thing of all time. When retailers take inventory, they have to count EVERYTHING in the store! So their goal is to get rid of as much merchandise as possible prior to the beginning of inventory so they don’t have to count it. What this means for us, as consumers, is that if you start scouting out stores now, and notice any signs of inventory prep, then you should make a beeline for the clearance racks. The major sign of inventory beginning is bright signs or tags on individual items or displays. The other way to find out when inventory is happens to be fairly simple. You can just ask a store employee because they will certainly know when it is going to occur. Once you have that information, make sure to go back to the store a few days before the onset of inventory with a checklist of what you are looking for. Happy hunting! I know it can be hard to think when is the next time you will purchase winter apparel right now when all we want to do is lay out in the sun somewhere warm. But, if we want to keep our clothing budget on track, then foresight and planning ahead are always the way to go. If you follow these tips and tricks, then you should easily be able to stock up on all of the winter apparel you need and still come in well under budget. What are some tips and tricks you have used to get the best deals on winter apparel?